“From the correspondence of Joseph Kanaki, 18 March 1943:” Dear Mother, things had gone from bad to worse for the crew and passengers of the “Lucy Goosey.” Not only were we stranded on Barsoom, which author Edgar Rice Burroughs had identified as the planet Mars, but we had also gone back 1 million years in our hunt for mad scientist Zylor Bar [Zī-lōr Bâr], also known as Thuran Gan. Zylor Bar had kidnapped U.S.O. entertainer Lucy McIntyre and Kal Kirad [Kal Kē-Rad], a Lotharian jedwar [ĵed-dwr, or admiral]. We took harnesses from insectoid magongi [ma-gân-gē] at the Tasor (Té-zōr, “sun tower” or lighthouse) in the city-state of Horz [Ōr-is] and used them to teleport to the Morbus Island. Unfortunately, we got a hostile reception from Zylor Bar’s guards, and only Jasoomians [Ĵâ-süm; Earth folk] Capt. William “Rip” Rohrer, Betsy “Blaze” Harper, and I remained free. We had gotten off the tower at the island’s summit, thanks to a pterodactyl-like Gwar [gwr], but our landing in the jungle wasn’t very gentle. Meanwhile — as we later learned — our friends were being held in a dungeon. Onetime boxer Beauregard “Bo” Jennings struggled get one arm free of his manacles, while scout Kar Dalan sized up the opposition. Feline masenas [mâ-sēn-â] Olera Gala and “Blinky” were rendered unconscious by Le Um Lo [Lē Üm Lō], the aged “embalmer” also kidnapped from Horz. Our Barsoomian allies, Van-tija [Van-tē -ĵâ] and Kal Kirad, were also captives. After some debate, Rip, Blaze, and I decided to teleport back to the Tasor in Horz for reinforcements. We had two spare harnesses with small crystals taken from darseen, chameleon-like animals similar to the masena. The captain and the Amazonian athlete hoped to get soldiers, but we didn’t know whom we could trust. Instead, we ran to the academy of biologist Ro Tan Bim [Rō Tan Bim]. I was uncomfortable with his eugenics experiments, which included creating a race of “First Born” from Bo’s blood sample, but the orovar [ōr-ō-vâr, or scientist] tried to be helpful. Ro Tan Bim took us to mentalist Lum Tar O [Lüm Târ Ō], who could help us locate our friends. This geezer claimed he could summon an army whenever we needed it, but we just thought he was crazy. He wanted to examine red man Kar Dalan’s “ordered mind” in return for his aid. We used the harnesses to return to the tower on Morbus Island, but our foes appeared to be bugging out. We encountered few guards, and as we descended the ramp, we found that our companions had broken free. Bo had grabbed and smashed a guard, and Rip had attacked the sentry watching Le Um Lo. The old man was happy to be reunited with colleagues Ro Tan Bim and Lum Tar O. We were distressed to learn that “Blinky” had been beheaded. Olera admitted that the seenar [sēn-âr], the rare stone that powered Zylor Bar’s teleportation and time-travel devices, came from masenas. No wonder the darseen organs powered his guards’ harnesses! Most of their activity seemed to be down by the harbor village, but Lum Tar O sensed that Zylor Bar himself was teleporting between the astronomical observatory and the “Dusar” [Dü-zâr, or “northern fish”], a ship with anachronistic Barsoomian technology. Since we had a limited number of harnesses, Kar and Blaze made for a rookery to seize another Gwar. Capt. Rohrer and I took point to guard the scientists. Olera turned invisible, and Bo and Van-tija followed as we made hops to the observatory. I didn’t realize it at the time, but Kal Kirad wandered off. Blaze and Kar Dalan defeated two Thermad [ŧür-mad] sentries and decided to share a flying steed. The white Martians were the ancestors of the Therns [ŧür-en], who in our time were a hidden minority in comparison with the four-armed, green Tharks or strangely attractive red Barsoomians. My squad arrived at the observatory, where the main telescope was trained on Thuria, Olera’s home moon. 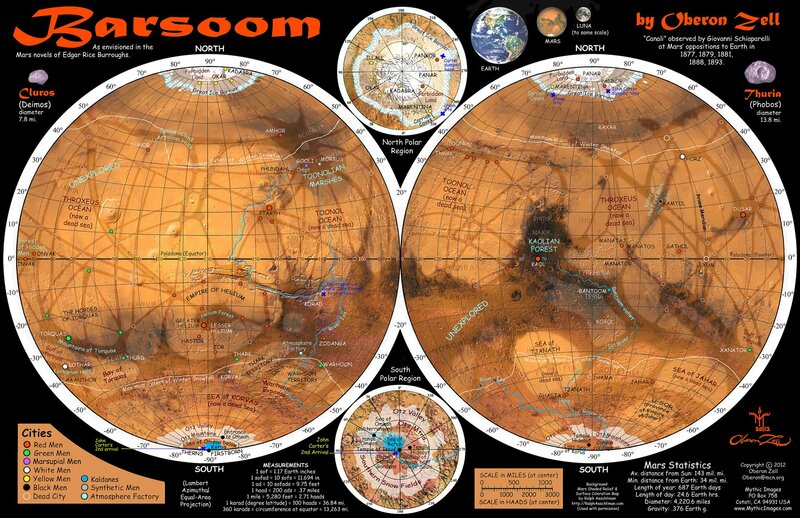 Van-tija explained that travel between Barsoom and Thuria involved “dimensional compression” and that even if the Dusar could fly, it could not get there without compensating for mass. Parts of the rotating telescope were missing, and we saw no sign of Zylor Bar. We decided to head down to the harbor, no doubt confusing Blaze and Kar, who watched us from the sky. I called in our marker with the orovar. Ro Tan Bim began meditating, and Lum Tar O created an army of 50 shadowy archers through astral projection to give us some cover. Kar Dalan directed his and Blaze’s Gwar into the Dusar‘s mainsail, as the rest of us raced to the ship. Rip dodged a blow and killed one of Thuran Gan’s goons. I was not so lucky, and I got stunned. Bo bobbed and weaved his way across the docks, even as Lum Tar O warned us that Zylor Bar was still jaunting between the ships and the observatory. Ro Tan Bim successfully summoned a silian [sil-ē-an], a huge sea monster that destroyed the Therns’ smaller vessels. Olera recognized Hor Kai Lan [Ōr Kī Lan], the jedwar or warlord who had betrayed Horz by worshipping the false goddess Issus (our own Lucy, as set up by Zylor Bar). His brother Kam Han Tor [Kam An Tōr], the prince who designed the Dusar, was also on the island. Bo grabbed me and pulled me onto the Dusar, even as the silian approached. The behemoth was distracted by the Gwars, including the one ridden by Kar and Blaze. Rip and Olera found the Dusar‘s staterooms empty, and the ship began splitting in half! Zylor Bar had Lucy and was piloting a large modern Barsoomian flyer or teezar [tē-zâr] from the hold, even as the silian crashed into the Dusar. Bo hit my harness so that I could join Van-tija ashore. The brave boxer then climbed onto the teezar, toward a hatch, as Rip landed on its cockpit. The silian clipped the flyer, and Zylor Bar took a seenar and Lucy and teleported out. Rip took a gamble and let go, falling away from the teezar and then teleporting into the pilot’s seat. Go, Cap’n! Olera, Van-tija, Kal Kirad, and I ran toward a large hangar, where we heard another vehicle firing up. Kar and Blaze managed to get back to the ground, while Bo and Rip also evaded the silian and came about toward the hangar. We found another flyer, apparently designed to travel to Thuria. One-eyed Olera raced ahead, still furious about “Blinky’s” demise. Kal Kirad and I drew swords and followed. Olera pounced on Zylor Bar, and they both teleported away. Kal made sure that Lucy was OK, and I grabbed the seenar. We followed Olera and Zylor back to the observatory, where the masena had pinned the Thern with her claws. I ordered Zylor to surrender, but Kal skewered the mad scientist. While I would have preferred to get Zylor Bar’s help to get back to Earth in our own time, I can’t say I was broken up by his slaying. Kal Kirad sealed his reputation as the greatest swordsman of his time, and we had stopped the menace from Morbus. Kar Dalan observed that Van-tija and the three orovar had disappeared, and we guessed that they went to Thuria to begin the populating of that moon, as well as the creation of some of Barsoom’s later races. Lucy announced her intention to stay with Kal Kirad, with whom she had fallen in love. Rip asked her to leave us the clues in the mines near Raxar to help restore the timeline. We could use the seenar to travel through time or space, but since we didn’t know how to get to Earth, getting back to the 20th century would have to do. Bo, Kar, Olera, Rip, Blaze, and I activated the seenar. We voyaged back to Raxar in our own time. Only three months had passed, and the red wastes of Mars were as we had left them. The “Lucy Goosey” had even been fixed! However, the gem was burned out, and we still have to find a way home. We returned to the mines, where this time, we found a projection of Lucy and Kal Kirad. She said they had found a way to duplicate technology to tap into the Tenth Ray of Mars. They and Carla Rizena had found the secret of longevity and a way to get to Africa [see “She: A History of Adventure“]. Lucy said she hoped to see us again. In the vault, we also found a burned-out cluster of darseen crystals in place of a seenar. My friends and I have now fought battles across worlds and eons and lived, so I guess we can wait a little longer to get back to the war in Europe…. Jason, I enjoyed your miniseries, and I look forward to whatever you might run later this year! Our face-to-face groups are about to begin a series of one-shots alternating with my “Vanished Lands: Vistel’s Circus” fantasy campaign on Monday nights through the summer. Be seeing you…. 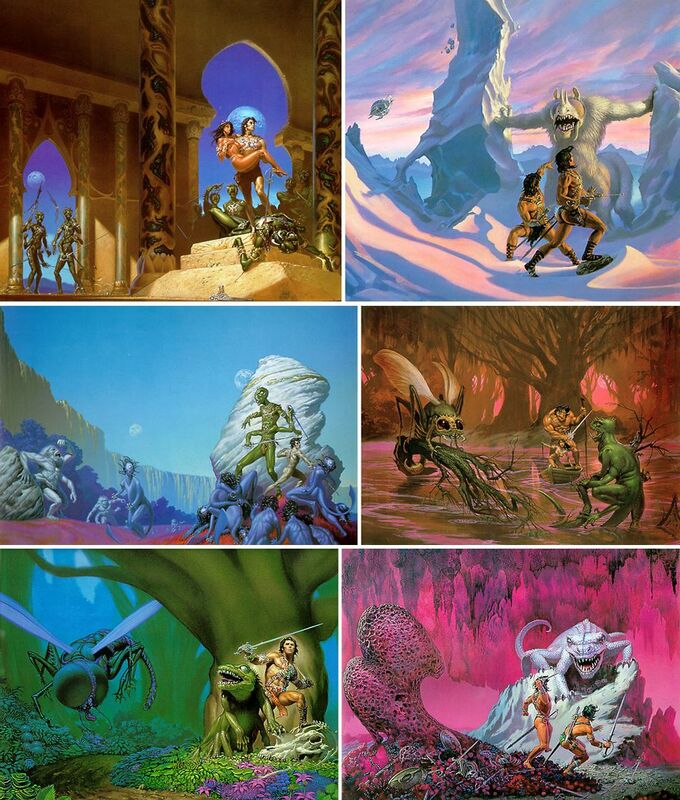 Posted on May 28, 2013 by GeneD5Posted in Games, Speculative FictionTagged barsoom, Barsoomian Adventures, mars, planetary romance, savage worlds, sfrpg, Tenth Ray of Mars, update.